Do you see this bowl? It’s about 13″ in diameter and more than 5″ high. We (7 people) ate about 4 bowls full and still weren’t finished. 1. Bring water to boil and add everything into boil and cook for 15 minutes (covered). 3. Let stand with ice for 10-12 minutes. For more pics from our Crawfish Boil Party, go to Flickr. Coming soon! Tammy’s demo on how to eat crawfish. posted by jessica	at 02:26 PM	Filed under American, Recipes. You can follow any responses to this entry through the RSS 2.0 feed. Both comments and pings are currently closed. 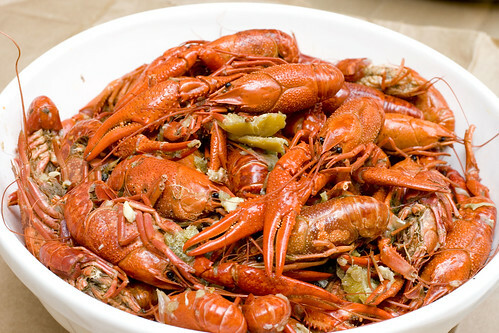 You can’t go wrong with a good ol’ crawfish boil! Delicious! This looks so good. I’d love to know how these were frozen. Vacuum sealed w/o water? In water? I really miss boils now that I live in No. Cali. I was back home in Houston 1 month ago & had myself a 25 lb boil with my brother. I put the few remaining tails in the boil water and froze them in containers but didn’t have enough room to haul back on the plane. I’m always bringing back pre-frozen LA tails (and boudin!) for etouffee but they just don’t taste as good as fresh. Heck, I even bring back Holmes pork sausage & blue Gulf crabs ’cause seafood gumbo requires the best ingredients! Never heard about the ice trick. Know plenty of people who keep a cooler for boils to keep the excess hot and spicy. 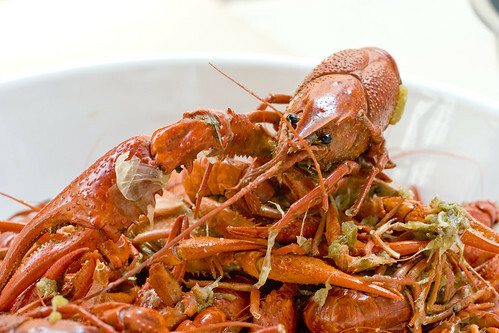 Hi Chanel, we actually let the crawfish cool to room temperature then simply bagged them in regular shopping plastic bags and placed the entire bag in the freezer over-night. For the airport, we put the frozen bag inside a larger garbage bag, inside a styrofoam box, inside a cardboard box. No dry ice or vacuum sealed bags were used. My flight was a quick 2.5 hours and as soon as I got home, I transferred the (still) frozen bag of mud bugs quickly to my freezer. Hope this helps! Tammy, I appreciate your response. Can’t wait to recreate the good old days of LA & TX boils out here in Cali.